Southeastern Virginia, Including Richmond, Virginia Beach, Etc. Southeastern Virginia, Including Richmond, Virginia Beach, Etc. 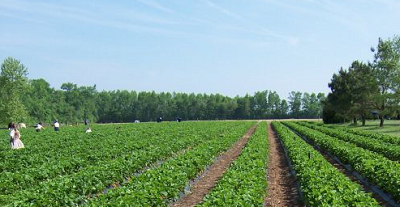 U-Pick farms: Find a pick your own farm near you in Southeastern Virginia, Including Richmond, Virginia Beach, Etc. for fruit, vegetables, pumpkins, organic foods,local produce and more! Looking for a local, pick-your-own farm in Southeastern Virginia, Including Richmond, Virginia Beach, Etc.? Scroll down this page and you will see the U-Pick farms in Southeastern Virginia, Including Richmond, Virginia Beach, Etc., sorted by county. Those that offer organic or sustainably grown produce are identified by the words "organic" and/or "sustainable" in Green, next to their name (see "What does Organic mean?"). The U-pick crops they offer follow the name of the farm. To search the page for a specific crop, use Ctrl-F (or on an ipad or Mac, use their "search on this page" function) If they have a website, the name will be in blue and underlined; click on it and it will open their website. If you find anything outdated or inaccurate, see the customer and farmer menus (as appropriate) at the top menu bar to submit updates and corrections and help me keep each current! 23350 Holly Farms Road, Jetersville, VA 23083. Phone: 804 561-5649. Open: 8 to 8, Monday-Saturday. Directions: Click here for a map and directions. Strawberries, tomatoes, squash, cucumbers, peppers, sweet corn, lettuce, cabbage, collards, bedding plants, hanging baskets, and Rocky Branch Farm homemade jam. 8200 W. Cool Hill Road, Providence Forge , VA 23140. Phone: 804-966-7357. Alternate Phone: 804-513-7044. Fax: 804-966-2690. Email: [email protected]. Open: 7 days a week 7 am to 7 pm by appointment only call for appointment. Directions: exit interstate 64 south on Roxbury road (route 106) turn left on Barnetts road (route 609) turn left on west Cool Hill road (route 631) county left west off of sign and will not fix it. turn left into farm driveway 8200 west Cool Hill road. Rosetree Hill Farm Barry's Berries Jan's jams. Click here for a map and directions. call and check for what is ready to pick, or e mail and request to be emailed when different berries are ready to pick. We do not use pesticides on the crops. Payment: Cash, Check, Visa/MasterCard, Discover. We also have mulberries and wonderful homemade jams made by Jan's Jams. We have 20 different jams we make a few are seasonal the rest available all year. Call and see what we have to purchase now. A visitor writes on May 24, 2013: "You can feed the chickens. there is talk of having soap making classes. The people are friendly and their apples are great. PEACH season is almost here! " 10425 Spring Run Road, Chesterfield, VA 23832. Phone: 804-822-0400. Email: [email protected]. Open: Early March through Early May; Weekdays: 8am to 6pm Weekends: 8am to 7pm. Directions: Near Pocahontas State Park in Chesterfield County (southwest of Richmond, Virginia). Follow the large, yellow, oval signs to a driveway marked with a sky blue mailbox and a tulip banner. Follow driveway down the hill to the parking area near the field. Please do not park near the house (private residence). Click here for a map and directions. Tulips are available from early March through early May (weather depending); Be sure to call in advance. Payment: Cash, Check. Bring your camera to capture beautiful images of your family and friends walking through thousands of Tulip and Daffodil blooms. Cutting tools provided. Plastic sleeves with water are available for your convenience to easily carry your bouquets. Weekdays: honor pick and pay (cash/check only) Weekends: Farmers are onsite to assist you. Debit/Credit card payments accepted on weekends. Comments from a visitor on June 10, 2012: "This farm is very expensive. Just to get into the farm, it costs $5/person. Can't even pick berries without paying this admission fee." Comments from a visitor on April 30, 2009: "My family with young children has really enjoyed this farms pick your own pumpkins and strawberries. I have been to many farms and think this was a top notch experience. Go on festival days if you enjoy activities for children." 17210 Genito Road, Moseley, VA 23120. Phone: (804) 739-2037. Email: [email protected]. Directions: From Richmond, take Route 60 or Powhite Parkway to Charter Colony Parkway. Turn left, go to Genito Road, turn right, go 4.5 miles and look for signs. Open: April through October. Call for hours and picking information. Ask about our mums for your fundraiser. Pick-your-own and fresh-picked blueberries and vegetables. Annuals, perennials and hanging baskets from our greenhouse in the spring. Mums, pansies and pumpkins in the fall. Adams Acres- strawberries, strawberries, blueberries, butter beans, all sorts of greens, including collards.- strawberries, strawberries, blueberries, butter beans, all sorts of greens, including collards. Comments from a visitor on May 03, 2011: "We LOVE Adams Acres. Excellent picking for strawberries and blueberries. Best to use phone over internet to get in touch with them. " Comments from a visitor on August 17, 2009: "We went for the first time last Monday, and we will be regular customers! The produce was wonderful and fresh, the people friendly, and the pick your own blueberries were not only a great experience, but the best I've ever eaten! I can't imagine buying grocery store produce after eating Adams Acres food." Another visitor tells me "Adam's also has a sign up list- they will call you when certain produce is ready. It's great!! They also hand our recipes every year- at least with the strawberries. They have reliable hours (I'd check to see- they might be longer than what is listed above) and have time/produce updates on their answering machine." Jarrett's Produce - beets, tomatoes, blueberries, blackberries, zucchini, squash, watermelon, okra, beans, cantaloupe, and more. 27317 Reams Drive, Petersburg, VA 23805. Phone (804) 861-3551. Cell (407) 579-6719. Open: Be sure to call before you go; their Facebook page has not been updated since 2017. Directions: From 85 south take Squirrel Level Road exit, follow Halifax Road south (toward Richard Bland College) for about 8 miles. Take a right on 606. There may be a sign (a printed sign, not from above!). From 95 south take the Courtland exit, then north on 35, left on 605, 2 miles left again on 605, follow to Halifax Rd and take a right, take a quick left on 606. Click here for a map. Comments from a visitor on July 02, 2016: "Jarratt's is great- they have lots of fresh seasonal produce like blueberries, tomatoes, onions, watermelon, peppers, beans, various summer squash (yellow, zucchini, pattypans), etc." Comments from a visitor on July 10, 2008: "We visited Jarrett's today after getting the suggestion from this website. We had a great time! It looks small from the road, but you have to ride back to the orchards, vines, or bushes. We picked blueberries and blackberries. Nice people, and clean, family friendly fields with lots of juicey fruit! It was worth the trip!!! I would suggest directions from different points in Virginia. We found it easily using mapquest"
2638 River Road West, Maidens, VA 23102. Phone: (804) 556-4164. Open: 7 am to sunset, Monday to Saturday; 1 pm to sunset, Sunday. Call before coming. Directions: Route 6, 1/2 mile east of intersection of Route 522 south and Route 6; or Route 6, 1 mile east of Goochland Courthouse; or Route 6, 17 miles west of Parham Road; or Route 6, 12 miles north of intersection of Route 60 and Route 522; or Route 6, 5 miles south of I-64 at Oilville interchange. Bring your own containers. We are a small family run farm located in Franklin, Virginia. We started our "u-pick" strawberry patch 9 years ago and had such a great turn out that we have been doing it ever since. 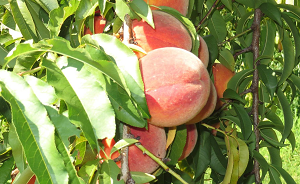 Comments from a visitor on June 26, 2011: "Lots of u-pick peaches, but you need to call/verify the week or so they do u-pick. These are not freestone peaches, have both yellow and white, but only yellow for u-pick when there. They provide containers and ladders. Nice people." Comments from a visitor on May 10, 2010: "My family and I went to Wood's Orchard in Hampton Va Saturday 5/8/10 after reading what another customer had wrote on this site about them. THEY WERE EXCELLENT!!! Friendly, great customer service. The berries are giant..bigger than the size of golf balls. On the tractor ride they tell you a little about the farm's history. It is family owned. There is an employee that stays in the field and comes by to "check" on you. Once back at the store, they bring you carts to take the berries to the counter. The plants are on top of plastic so they are not really dirty. My husband and I picked over 30 lbs in 30 minutes. Easy picking! Thanks for this site!!! Looking forward to going there for peaches soon." Comments from a visitor on May 02, 2010: "We visited Woods Orchard on May 1, 2010 to for the u-pick strawberries. They take you to the field on a hay ride, a short distance for a $2.00 per adult charge. The berries are $2.00 a lb but you use and keep their flats. The berries are big, juicy and smell delicious! The fields are beautiful and the plants are on plastic with no weeds, the berries are very, very easy to pick. We picked 18 lbs in about a half an hour. They said they would probably have berries for about 5-6 more weeks. " Comments from a visitor on May 01, 2011: "I went to Dodd's Acres Farm in Hanover last weekend- the strawberries were unbelievable- falling off the vine and huge! Great prices too- friendly staff. We have always enjoyed that farm"
15575 Tyler Station Road, Beaverdam, VA 23015. 4506 Millers Lane, Richmond, VA 23231. Phone: 804-222-2285. Directions: from richmond-I64 east to exit 195 Laburnam Avenue, turn right, go to first light, turn right on Gay Avenue, go 1/2 mile turn right on Millers Lane. YOU'RE HERE! Click here for a map and directions. Open: October 1 till October 31 from 8 am till dark, 7 days a week. Pick your own pumpkins all October. Also, hayrides, straw maze, romping pile fall decorations of all shapes, colors and sizes. Enjoy a day in the country listening to the roosters crow! Payment: Cash, Check, Visa/MasterCard, Discover, AmEx. Bush Neck Farm - Pick-your-own apples, blueberries, sweet corn, peaches, pumpkins. A visitor writes on July 29, 2013: "July 2013 - Went twice during blueberry season and was amazed at how many blueberries there were. It was a long drive, but beautiful and well worth it! Abundant blueberries for $2/lb. No crowds to deal with and had no encounters with wasps, etc. Already planning to go again next year! (James City, VA)"
A visitor writes on July 03, 2013: "Me and my two young kids had a great experience today at bush neck! David was very nice and the fruit was beautiful. We picked and smacked on blueberries and peaches and enjoyed the singing birds and georgeous property! It was a long drive out there but well worth the trip! We will definitely be back :-)"
Comments from a visitor on May 05, 2011: (positive) "My 11yr old daughter and I went to Bush Neck Farms in Williamsburg last year. We had a great time and was pleasantly surprised to find the owner was her retired elementary school principal. The owners were very nice and accommodating. The peaches were in abundance and sweet. I believe they have only white peaches. The peaches & blueberries were easy to pick in well maintained groves. The blueberries were at the end of their season, but we still found plenty to pick. Will definitely go back again." Comments from a visitor on May 01, 2011: (positive) "We have been going to Bush Neck Farms several times a summer for 8 years. The owners are wonderful- they have watched our children grow up and care about our family. They love what they do and how they do it. The location is stunningly beautiful and the peaches and blueberries are amazing. By far our favorite picking location! " Comments from a visitor on July 13, 2010: (positive) "I visit Bush Neck Farm with my family every year. We always enjoy the blueberries, apples, and peaches. The prices are reasonable, not outrageous, and the owners- while they don't always seem bubbly or excited to see you- are good people. The gentleman that owns the farm and spends most of the summer out in the heat has always been patient and pleasant when I have been there. I hope that future visitors are not so quick to judge. " Comments from a visitor on July 11, 2010: "The farm is a half-hour drive from Rte.60. I note that one former visitor used the term "crumudgeonly"(sic)to describe the owners of this farm. I think the actual term should be "curmudgeonly." I would use the simple term "grouches." Be forewarned: They only accept cash AND only checks from James City County, Williamsburg, Poquoson and Yorktown!? They were skeptical about allowing use of our own picking containers as well. Needless to say, we moved on without their berries. There are friendlier farms in the surrounding counties." Comments from a visitor on July 01, 2010: (positive) "Went blueberry picking on June 30th. Delicious and plentiful! Also picked yellow transparent apples for applesauce. " A visitor writes on July 03, 2014: "I went today with my children and we had a wonderful time. We picked a bucket of blue berries and a pint of raspberries. The farmer And his son were very nice, offering us water because it was hot and driving us to the best berry picking sections on their golf cart. We also bought yummy honey and farm made jelly. We'll go back again." A visitor writes on July 02, 2014: "Today we stopped at Couch's Corner Berries in New Kent, Virginia. We picked five pints of amazing, delicious raspberries! The prices are very reasonable, the berries healthy and plentiful, and Mr. Couch was very helpful, even giving us bottles of water when it got hot. He stated that he has quite a bit of honey, and described his beekeeping experience as well. We will be back! Couchs Corner is just a mile or two from the Providence Forge rest area off I-64 and very easy to find. " 2276 Ridge Road, Blackstone, VA 23824. Phone: 804-926-1875. Email: [email protected]. Click here for a map and directions. Crops are usually available in April through October. Open: Monday to Friday 10 am to 8 pm; Saturday 8 am to 8 pm; Sunday 11 am to 5 pm. Strawberries begin late April to early June; Spring produce includes peas, broccoli and spinach; Summer produce begins early June with corn, tomatoes, squash and more; Pumpkins, gourds and winter squash from September until Halloween. Payment: Cash, Check. Tomatoes and sweet corn available from June to mid-September, with bulk prices for canning. Many heirloom varieties all summer long with already picked items available each day. Fresh chicken and duck eggs available year round from pasture raised poultry. 280 Horsepen Road, Farmville, VA 23901. Phone: 434-391-3377. Alternate Phone: 434-607-3584. Email: [email protected]. Open: Click here for current open hours, days and dates. Picking updates: Click here for picking updates. Directions: Click here for a map and directions. Payment: Cash, only. Click here for our Facebook page. Faith Farms - strawberries and berries. 2505 Pittmantown Rod, Suffolk, VA 23438. Phone: 757/438-2997. Alternate Phone: 757/484-2682. Fax: None. Email: [email protected]. Open: Sunday from noon to 5pm; Monday through Saturday from 9am to 5pm; Please always call first before you drive out here, to be sure we have product to be picked. Directions: Click here for a map and directions. We use natural practices, but are not seeking organic certification. Payment: Cash, Visa/MasterCard, Discover, AmEx. Click here for our Facebook page. We will be celebrating, Golden Eagle Farms 1st annual Alpaca Farm Days on Sunday September 29, 2013, from noon to 5PM. You will be able to feel how soft an alpaca really is. You may also lead a llama around a part of the farm, shop for alpaca clothing in our shop, and purchase produce from our stand. You may also walk around the farm and see the Guineas, chickens and ducks. 123 Raleigh Drive, Suffolk, VA. Phone: 757 620-8677. Open: Call for hours. Directions: Click here for a map and directions. Pick your own and pre pick strawberries. 2800 Tyre Neck Road, Chesapeake, VA 23321. Phone: 757-483-9880. Alternate Phone: 757-435-2085. Fax: 757-483-3245. Email: [email protected]. Directions: When heading North on I-664 from Chesapeake or South on I-664 from Hampton take Exit 9a/Route 17 North. Go approximately 3 miles. Pass Lancaster Farms on your right. Go up two lights. Make a left onto Bennett's Pasture Road at the Burger King. Our strawberry patch is located a little less than a mile on the right. OR If you prefer to take the James River Bridge to Suffolk please check out the following. Take James River Bridge South bound to Route 17. Turn right on Bennett's Pasture Road. Our strawberry patch is located a little less than a mile on the right. See this page for more directions. Click here for a map. Also Click here for picking updates. Crops are usually available in April, May, June. Open: Variable; open most days. Please call ahead to verify. Strawberry seasonal hotline is 757-483-9880. Strawberries: late April to early June Payment: Cash, Check. 1501 Gum Bridge Road, Virginia Beach, VA 23457. Phone: 757-401-7262. Open: Monday thru Saturday 8 til 6; Sunday 12 til 6. Directions: Head south on Princess Anne road in pungo. Look for Gum Bridge road on the left across from the Aviation museum.Stay straight for about 3 miles. go throught the intersection and in a 1/4 mile our stand is on the right!! see you there!!. Click here for a map and directions. We use natural practices, but are not yet certified Organic. Payment: Cash, Check. Comments from a visitor on June 26, 2012: "Wnet here on sunday 6/24/12 and Beatsons Does not accept credit cards.... ONLY cash or check." Blackwater Vineyards - grapes - several varieties of muscadine/ scuppernong (black and bronze). 4280 Blackwater Road, Virginia Beach, VA 23457. Phone: (757) 421-9161. Email: [email protected]. Open: They are reported to be closed since 2016, does anyone have more recent information? Directions: From I-64, take Indian River Road east to North Landing Road. Turn right on North Landing, cross bridge and turn left on Fentress Airfield Road and left on Blackwater Road. Vineyard is 3.5 miles on left (approximately 13.8 miles from I-64). Open: 8 am to dark, Tuesday through Sunday. Picking season - September and October. Vineyard is well maintained. Plenty of parking. Free picking containers. Restroom available. Call for picking conditions. Henley Farm and Henley Farm Market - Strawberries, blackberries, sweet corn, tomatoes, kale, potatoes, beans, pumpkins, collards, Christmas trees. Comments from a visitor on July 09, 2011: "Tons of huge, sweet, thornless black berries. Corn, oh yeah! Good times, good people." Comments from a visitor on May 10, 2009: "I have been going to Henleys for 20 years and it is a family run farm and they are all very friendly and caring and if you ever get the opportunity to meet any of them you will know what I mean especially the older Mrs. Henley very sweet old lady just like her husband not saying that Stormy isnt sweet but Mrs Henley has a few years on her.LOL. Make sure you go all the way down to the farm and not just to the farm stand Not saying the farm stand isnt good but the extra mile is well worth the trip for the harvest. All year long if they have a growing season for something they have it growing. Hours are always subject to change to call first.. They take most form of payment including credit cards. They have portajohns for those emergency stops. In the fall they have a hayride to the pumpkin patch and on mother's day they have hanging flowers at reasonable prices for gifts. You can also buy some bedding plants or veggie plants for your own garden. " A visitor writes on November 19, 2014: "Mrs. Horsley called back promptly and was very gracious. We set up a time in the afternoon, and when I got there two other people were picking pecans. They are absolutely delicious and flawless and quite reasonably priced. Mrs. Horsley was very kind to me even though her whole family are Hokies and I am a Wahoo. This is a small part of their very large operation. It is great that they make their pecans available to us. We're planning on some pie for Thanksgiving! " Lilley Farms and Nursery, Inc. - Pick-your-own and fresh-picked strawberries. Munden Farm - Pick your own strawberries. Comments from a visitor on June 27, 2011: "Opened on June 27, 2011. Great place, great prices." A visitor writes on July 25, 2014: "I love visiting this market all year round! You can always find the freshest stuff around and it is truly "fresh from the farm" and not a warehouse. Nothing compares to the prices or quality, especially in the summer time! One visit and you'll be hooked on it. The kids enjoy going all the time. :-) "
Comments from a visitor on June 26, 2011: "This place is wonderful! Kale, Swiss chard, dill, lots of different things to pick and the people are outstanding. You get personal attention from them." 402 W. Duke Of Gloucester Street Merchants Square, Williamsburg, VA 23185. Phone: 757-259-3768. Fax: 757-259-8064. Email: [email protected]. Open: Click here for current open hours, days and dates. Directions: From I-6: Exit 238 (Camp Peary), from Richmond turn right onto Route 143, and from Newport News turn left on to Route 143. Take a right at the second traffic signal onto Route 132 (N. Henry Street). Market is held on Duke of Gloucester street between Henry and Boundary Streets. From Route 199: Turn onto S. Henry Street (Route 132) at stoplight. Market is held on Duke of Gloucester street between Henry and Boundary Streets. Click here for a map and directions. Payment: Cash, Check, Debit cards, Visa/MasterCard. Click here for our Facebook page. Many Virginia's Finest Certified vendors and Certified Organic Vendors. More than 35 vendors total. Visit our website for special events and holiday market dates.